Last week, Holly Otterbein reported that Delaware County Democrats had failed to endorse a candidate for the PA 5th House District Race, split between candidates Mary Gay Scanlon and Ashley Lunkenheimer. Chair of the party David Landau expressed disappointment that the Delco Democrats failed to endorse someone for the seat, and has previously expressed a misgivings about the leading candidate Richard Lazer, winning the race, saying that he hoped the district could be represented by someone from Delaware County (the fifth district, for the most part, is comprised of about 80% Delco. residents.) And that’s the big publicized split over PA-5—should a Philadelphian represent the fifth district? According to Mary Gay Scanlon’s professional biography she is the chair of the pro bono team at Ballard Spahr, a massive national law firm based in Philadelphia. She’s also “a member of the Association of Pro Bono Counsel, and serves as Co-Chair of the Philadelphia Bar Association's Law Firm Pro Bono Committee and on the board of Philadelphia VIP”, a local pro bono legal aid group. Her campaign website touts her experience as a progressive fighter and she seals her progressive cred with a plethora of strictly progressive policy positions. Missing however from the list and from her experience are any mention of progressive tax reform, banking and finance industry reform, or consumer protections. This is where her husband, Mark S. Stewart, and their mutual employer lawfirm Ballard Spahr LLP are worth taking a closer look at. Protesters fighting against unfair housing debt. Ballard Spahr focuses on many legal areas including finance and pharmaceuticals. They were also recently in the news for leading the charge to block a major regulations from the Consumer Financial Protection Bureau. This was the agency put in place after the 2008 collapse that was supposed to give citizens a way to take legal action against banks and financial agencies that preyed on low income people and caused the crash. The online law journal Law360 praised Ballard Spahr for going after the CFPB. Indeed, this became one of the key revenue streams for the law firm, and they sank millions into court cases and lobbying efforts. Those efforts paid off, and in 2017, President Trump basically eliminated the CFPB. A house facing foreclosure in New Jersey. While it is entirely plausible to contest the importance of this case in relation to Mary Gay Scanlon’s personal record, it is harder to separate the fact that Scanlon is married to the head of the firm and her campaign is largely financed by firm employees. In a strange paradox, Mark Stewart’s law firm actively promotes legal actions that keep poor people in poverty, while Mary Scanlon’s pro-bono legal work provides assistance to people in poverty who can’t afford a lawyer. Holly Otterbein and Andrew Seidman report that: “Contributions from BallardSpahr attorneys account for about 45 percent of the $254,000 Scanlon raised through March. That does not count the $150,000 she lent her campaign.” These campaign finance records cast Scanlon’s ability to distance herself from Ballard Spahr’s interests further into doubt . 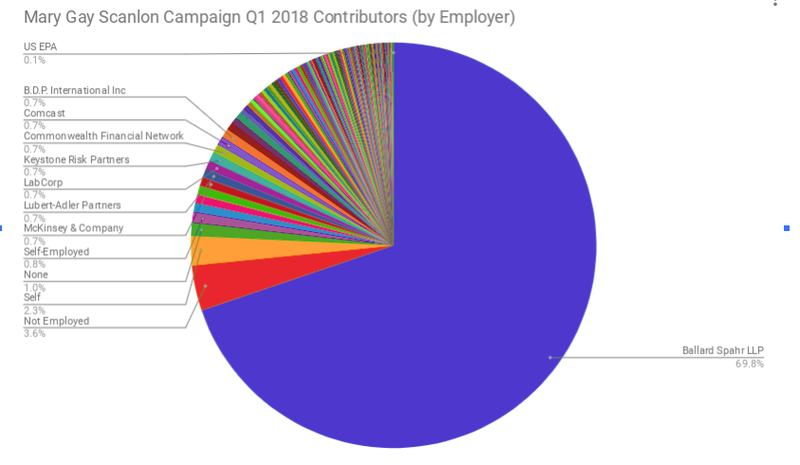 It may be plausible to wave off the actions of Scanlon’s employer as unrelated to her campaign, but the fact that Scanlon’s campaign is largely financed by Ballard Spahr employees is another matter. We are in a time where we can’t waste effort and votes on someone who is not wholly, fully, personally invested in dismantling the structures of inequality that maintain the status quo. Mary Gay Scanlon may personally believe all of her “progressive” points, but it is important to ask whether she would be able to say “No” to a lobbyist paid for by her husband’s firm, and her largest donor, and vote to protect those who need the most protection. Check out the sources and more links here.